Bob Behning is a former small business owner who is passionate about creating more jobs for Indiana residents, enhancing the education for Hoosier children, and protecting taxpayers from wasteful government spending. 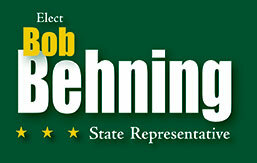 As State Representative for House District 91, Bob Behning has made getting Hoosiers back to work a priority. Bob has worked closely with Governor Pence to create the best climate for job creation in the Midwest. Bob Behning serves as the chairman of the House Committee on Education and has been one of the state’s most important leaders in improving Indiana’s education system. For instance, Bob authored legislation to create the nation’s most expansive school choice scholarship program, giving Hoosier families the ability to choose the best educational environment for their kids. He’s also been a key leader in strengthening Indiana’s public charter schools and ensuring that dollars follow the child in education funding. Bob Behning has championed efforts to protect taxpayers and reduce the size and influence of government. Bob supported the passage of constitutional property tax caps, as well as requiring referenda for taxpayer funded projects. He has stood firm in demanding a balanced state budget with no tax increases and continues to support smaller and more efficient government. Last year, he supported the largest tax cuts in Hoosier history benefiting workers, families, small businesses and farmers.